It's that time of year when we look back before looking forward to the new one. 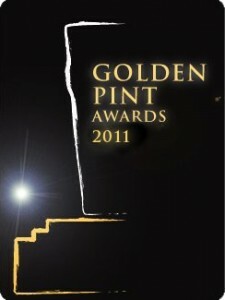 With that in mind, below are my Golden Pint Beer Awards nominations for 2012. Best UK Draught (Cask or Keg) Beer: Buxton Gold. Had a bit of a moment at Reading beer festival this year, which prompted an impassioned tweet. After several boring brown beers, I ordered a half of this. It sung from the glass right down to the last mouthful. Then I went back for a pint, and another, and maybe one more. Then I missed my train home. Best UK Bottled or Canned Beer: Magic Rock Cannonball. This beer has just got better and better. The latest batch is absolutely sensational and now that they're bottling in the brewery, we'll hopefully see wider availability of the Huddersfield nectar. Best Overseas Draught Beer: Regular twitter followers will be bored by now, but Green Flash West Coast IPA at the brewery was special. Best Overseas Bottled or Canned Beer: I've been a bit spoiled this year but the beer in question was a recent, small sample in London of Anchorage Galaxy White IPA. Wow! Where can I buy one to enjoy at home, please? Best Overall Beer: Thornbridge Raven. See last year's post. No reason to change. I think it's special and the world beer cup judges agree, so there! Kernel Citra IPA ran it close though! 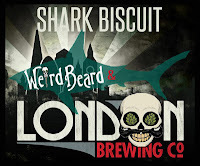 Best Pumpclip or Label: Weird Beard Shark Biscuit (collaboration between Weird Beard and London Brewing Company), designed by Daniel Vane. 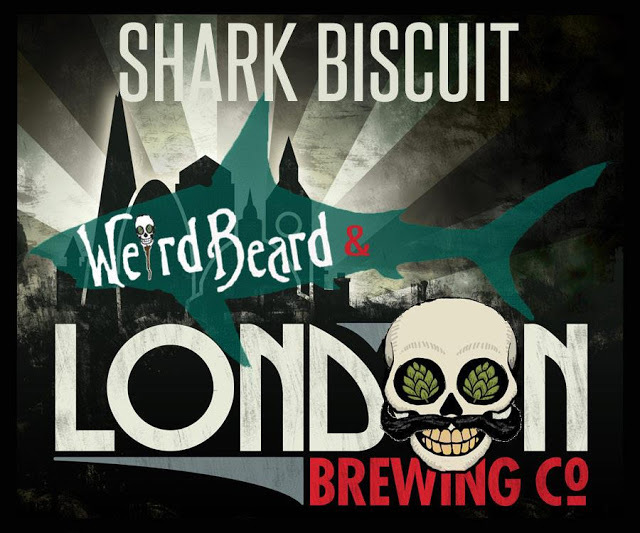 Both breweries are worth following this year with the former due to start commercial operations in January and the talented Daniel having recently taken over as head brewer at the latter. I've sampled plenty of prototypes/home brew from both this year and have enjoyed it all! Best UK Brewery: Summer Wine have gone from strength to strength this year and I think 2013 is going to be even better for them. Two of the nicest and hardest working guys in UK brewing deserve every inch of the success they've earned, and will earn. Best Overseas Brewery: Stone, again. Pub/Bar of the Year: Craft Beer Co, Islington. It only opened last month but is already my favourite London boozer after just a few visits. For those who've not been, think Craft Beer Co (Leather Lane) meets traditional old London pub with a modern twist, complete with individually styled rooms and an Ol' Joanna! Beer Festival of the Year: Borefts. Wow! What took me so long to get to this festival? Supermarket of the Year: Waitrose. Love that I can buy an array of local beer in town and, should I feel the urge, fill my basket with White Swan or Jaipur. Independent Retailer of the Year: I only visited once (bad me) but the Beer Boutique in Putney is ace and I will return soon. Online Retailer of the Year: Has to be Beer Merchants, in that they've had most of my hard earned this year. Also think their social media presence is fantastic. Best Beer Book or Magazine: John Palmer's 'How to brew' has been on my bedside table all year. It's great for beginners but has so much more too. 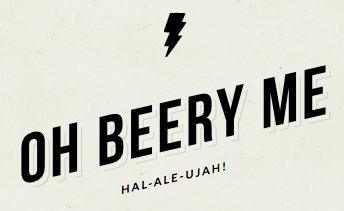 Best Beer Blog or Website: Oh Beery Me by @SheriffMitchell has been fantastic all year. Committing to review a beer a day for a year is one thing but doing it with such passion and diversity really set this blog aside from others this year, and some clever writing kept it fresh throughout. That said, I must also give an honorable mention to Phil Hardy's Beersay. Phil has architected some fantastic online events this year and is another person I was delighted to meet and share a few beers with. His blog has gained a lot of readers and rightly so. Best Beer Twitterer: @broadfordbrewer (David Bishop). Has supported me loads on the home brewing front and is as genuinely nice in person as his online persona suggests. Hope to share more beer with him next year - preferably stuff he's brewed! Best Online Brewery Presence: The one I've visited most is BrewDog's. Food and Beer Pairing of the Year: This was at the beer blogger's conference back in May - Sharp's Quadrupel served with banana and cream tart. I'll let Leigh over at The Good Stuff fill in the blanks. In 2013 I’d Most Like To: Well my 'most like to' in 2012 was to start home brewing. That's gone pretty well, so in 2013 I'd most like to brew on proper big kit! Open Category: You Choose: Still the most pointless debate: Cask v Keg v Bottle v Can v Wheelie Bin – I don’t care as long as the brewer is happy I’m getting their product via a dispense method which does it justice. (Yes, this is the same as last year. It's still just as prevalent and pointless). Beers of Europe stock Anchorage beer. Enjoy. I'd observe that it is far more important that the customer is happy than the brewer. Yes, agreed. Was interesting try the same beer in cask and keg yesterday side by side. Those were Magic Rock beers by the way. High Wire NZ better on cask for me. Thanks for the mention Andy. And as for brewing on big kit in 2013, how does 10bbl sound? You know it would be a pleasure to have you come brew any day. Thanks Bryan - would love to! Can't wait to see you guys up and running.